It is known as the Murphy's eye. It allows ventilation of the lung even when the bevel of the endotracheal tube is occluded. This event commonly occurs when the bevel is in contact with the tracheal wall. Shown here is a very important step in tracheostomy. Why is it being performed ? 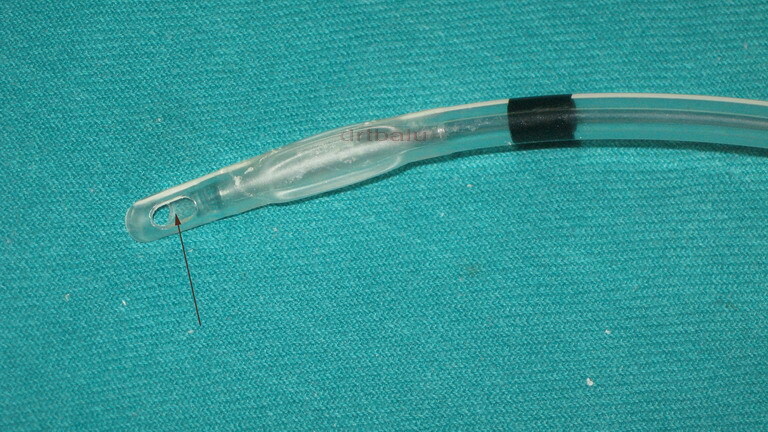 on withdrawal of the piston, it confirms that the needle is inside trachea. 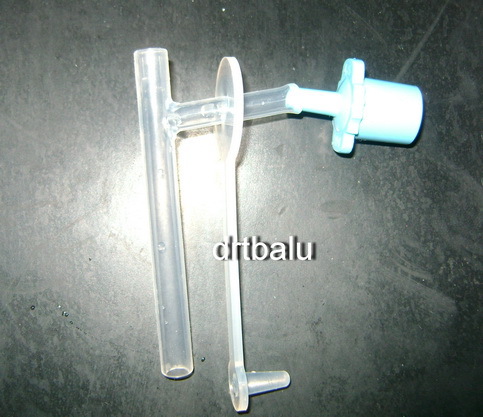 to suppress the cough reflex, which commonly occurs during tracheal incision. 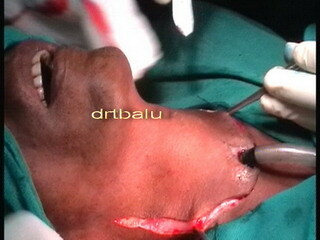 Where is the exact site of tracheal incision ? What surgical blade is optimal for this purpose ? 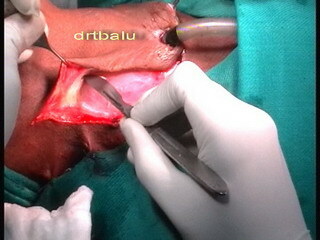 Incision is sited between the 2nd and 3rd tracheal rings. What is the name of the flap created ? What is its advantage ? It is known as Bjork flap. It is an inferior based flap. This is Gluck Sorenson's incision used to perform total laryngectomy. vascularity of the flap is not compromised. What is the plane of dissection in Gluck Sorenson's incision? to preserve the vascularity of the graft. What is the muscle seen in this picture? It is the sternomastoid muscle. 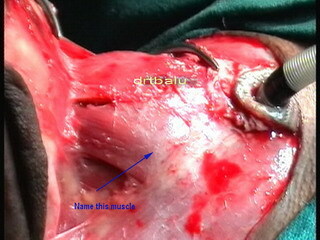 Under this muscle lie the carotid sheath and jugular group of nodes. It is the omohyoid muscle. This muscle should be sectioned to expose the larynx. This muscle should ideally be sectioned close to its sternal end. What is the name of this tube? It is a Montgomery - T tube. This tube is made of silicone. It does not irritate soft tissues. for long term stenting of airway without any danger of tissue reaction / extrusion. normally through the nose and speak well. Name the incision shown in the picture. Name the surgery in which this incision is used. 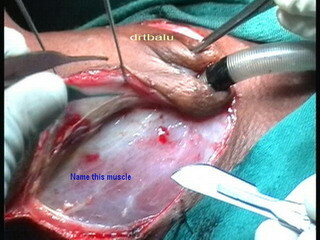 This image shows a Lazy Man S incision. 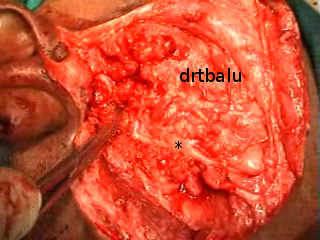 It is the facial nerve seen in the parotid bed after removal of superficial lobe of parotid gland. It is this nerve which separates the two portions of parotid gland (superficial and deep portions). deep portion of the superficial layer of cervical fascia.